I've already expressed my love for this Fulci classic during Hugo Stiglitz Makes Movies's Italian Horror Blog-a-thon with my thoughts. Nothing has changed and The Gates of Hell (my preferred alternate title) simply gets better every time. 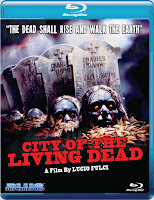 I almost said this in that review, but this film feels like what Fulci was constantly trying to re-capture in the twilight years of his career. Unfortunately, the wonderful creative team behind him just wasn't there in his later period like il maestro's late '70s/early '80s gore-caked heyday. That and both Christopher George and Catriona MacColl not merely showing up for a check and exuding quite an approachable likability. Paura nella città dei morti viventi is nonsensical, wafer thin claptrap but has tremendously foreboding atmosphere that sticks to your ribs long after its conclusion and some of the most memorable gore effects in modern horror. This mood lends itself well to a perfect late night drive-in feel, be it Italian-made or not, making for an excellent starter course for a late night horror marathon. 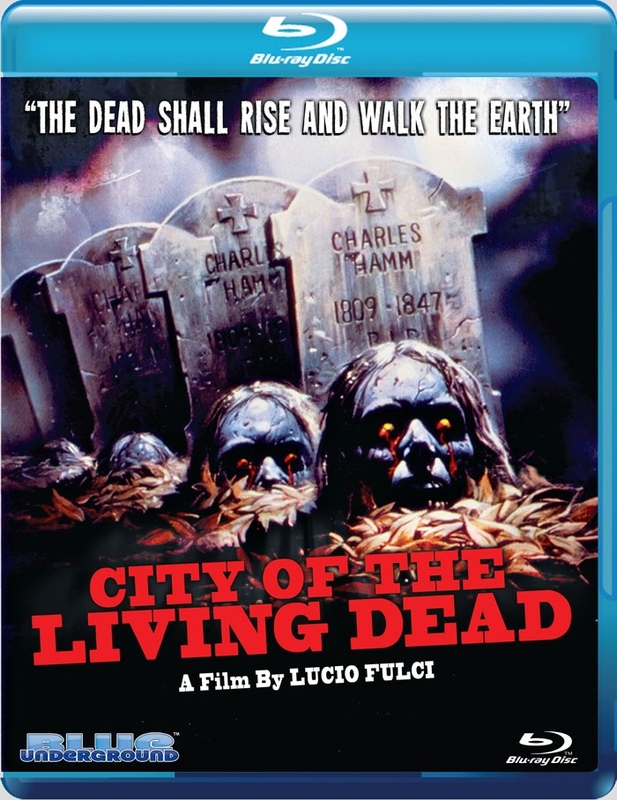 Well, whatever comes afterward probably won't compare--unless you indulge in more prime Fulci. Blue Underground's new Blu-ray minted from the original negative is the source of a bit of controversy on some audio/video forums along with the studio's BD of Corbucci's classic spag western Django (1966). The incessantly grainy image is up for debate about being truly natural or some strange layer of digital manipulation created to mask restoration work. I haven't seen Django firsthand yet, but CotLD seems to be a case of finding detail where you find it. Many shots seem slightly blurry from the camera work (especially with Fulci's love of focus), but immediately after the next shot will be striking in detail and so forth. There's also a very enhanced sense of three dimensional space in certain scenes within the 1080p transfer. Grain appears more "integrated" into the film stock than BU's previous The Bird with the Crystal Plumage and The New York Ripper; so I'm at a loss as to whether it's more video noise than grain or a side effect of the cheaper 2-perf 35mm stock used. Colors are significantly more saturated than the Anchor Bay/Blue Underground DVDs. I actually prefer the desaturated look of the standard def discs; as it adds to the film's impeding gloom. The Blu-ray might actually be too colorful since fleshtones look almost pastel-like. Overall, the good outweighs the "perhaps" bad and the 7.1 DTS-HD Master Audio track sounds extremely clean. To those who've seen The Gates of Hell countless times the sound quality might be more profound than the image. You could hear a pin drop in the quiet passages with zero distortion. Fabio Frizzi's fantastic soundtrack literally sounds "replaced" with an entirely remastered from the ground up master of Frizzi's work. I haven't checked out the new extras yet, but I might order Arrow Video's even more supplement-packed Blu-ray from the U.K. and and a big evening of special feature watchin' between both editions. I read the extras on the Arrow release are 1080p/50hz, you might check and see if your Blu-Ray player is capable of converting 50hz to 60hz or see if your TV is capable of displaying 50hz, most US TVs can not. The PS3 will not play the extras because of them being 50hz. Just thought I'd pass along the info.